WSL's summer program offers crafts, games, hiking, and wholesome nature-based play in the nearby meadows and forest. An engaging program for the mind, body, and spirit of children entering nursery through grade 5. An engaging program for the mind, body, and spirit of children in nursery through grade 5. The program is led by Amanda Boyler, who brings a wealth of experience from her role as camp director at the Aurora Waldorf School, and is open to all families, both within and beyond the WSL community. Parents can choose three individual weeks of full days (grades 1–5) or half days (nursery–grade 2 only), with optional early drop-off. Consistent with the mission of WSL, the program aims to cultivate in each child a sense of wonder and curiosity for the natural world, creativity, collaboration with others, and confidence to engage in new experiences. The program offers crafts, group games, hiking, and nature-based play on campus and in the nearby meadows and forest. To this we’ve added an essential ingredient for summer fun—water play with sprinklers and a shallow pool in our nursery play yard. Mixed-age groups provide a welcome chance for new and lasting friendships across the grades. And true to the Waldorf ethos, we'll have fun rain or shine, so keep those rain boots handy! 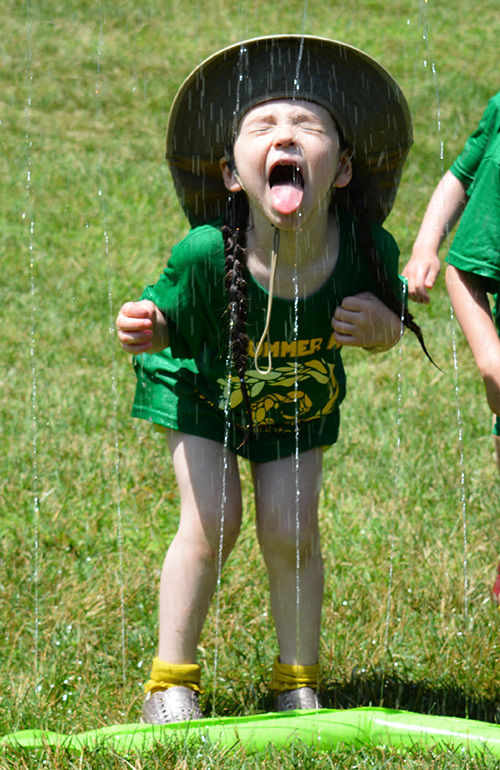 On a hot day, there's nothing better than a big green field and a sprinkler to run through (and wet your whistle!). Amanda taught at the Aurora Waldorf School and served as the director of their summer camp program. She is in her third year at WSL and is currently the school's Learning Support Teacher. Meg joined WSL as an assistant in the nursery program. She completing her Waldorf early childhood teacher training at Sunbridge Institute and during the school year leads WSL’s 5-day nursery class. Mary is a Waldorf trained early childhood teacher who has taught nursery and kindergarten for many years at the Waldorf School at Moraine Farm. Mary currently leads a kindergarten class at WSL. Each age group will also have an assistant and several counselors in training.